Time to get back into regular Bible reading? THE DAILY READING BIBLE series has everything you need to get started! Each reading is designed to take 15-20 minutes and contains the full text of the Bible for that reading, questions to get you thinking, points to ponder, and ideas for prayer. Paperback. 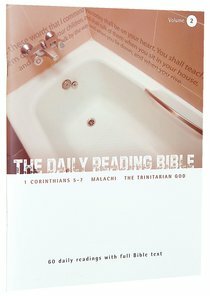 About "1 Corinthians 5-7, Malachi, and Studies on the Trinity (#02 in Daily Reading Bible Series)"